The life expectancy of seniors greater than 60 years of age can increase if they exercise regularly and stay physically active. 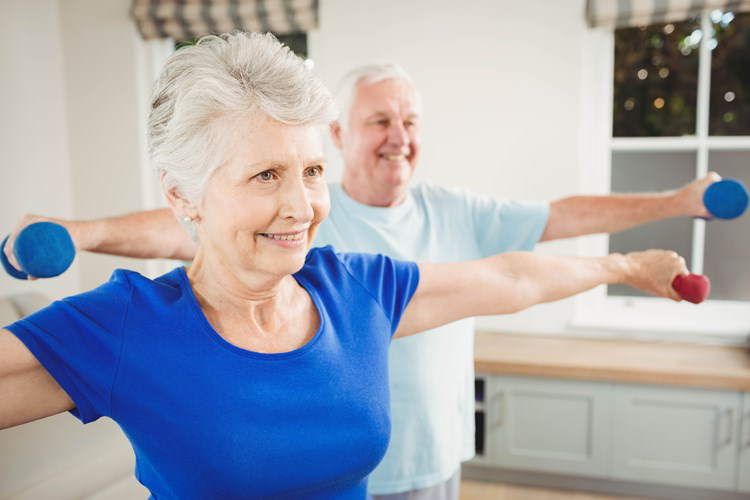 Seniors may decrease their risk to fall by doing a workout including exercises to build strength, balance and endurance. Regular exercise also reduces the risk of developing chronic diseases such as diabetes, heart disease and arthritis. Before starting a new exercise regimen ensure to consult your physician and get a checkup. It helps in relieving tension in upper back and neck. Stand with feet kept at a width of shoulders. Your hands should be kept relaxed at the sides. Turn the head to the right slowly without tipping it backward or forward. Stop when a little stretch is felt. Hold in this position for 15-30 seconds. Now turn your head to left. Hold in this position for 15-30 seconds. This is one of the exercises for seniors that helps in relieving tension in upper back and shoulders. Sit in a chair placing the feet on ground at a width of shoulders. Take the arms out and up in front at the height of shoulders with palms facing outwards. The back of hands should be pressed together. Reach the fingertips till a stretch is felt. Your back moves away from back of chair. Hold in this position for 15-30 seconds. These are done to increase strength in muscles of abdomen. While taking a deep breath, tighten the muscles of your abdomen. Hold in this position for three breaths. Release. These are done to increase strength in shoulders and chest. Stand around three feet away facing a wall, with feet kept at the width of shoulders. Leaning forwards, put the hands flat on wall straight in line with shoulders. The body must be in plank position and spine straight. Lower the body towards the wall. Push back. These are done to stretch and strengthen lower back muscles. Taking deep breath, tighten the buttocks and tilt the hips forwards slightly. Hold in this position for a count of 3. Now tilt the hips back. Hold for three seconds. This is one of the exercises for seniors to do at home that helps to stretch chest and strengthen the muscles that maintain posture. Sit straight in a chair. Rest the hands in the lap. Squeeze the shoulder blades towards each other. Make sure to keep the shoulders down and not hunched upwards towards the ears. Hold in this position for three seconds. Release. These are done to strengthen your lower legs. These help in strengthening the muscles of upper calves. Sit in a chair. While keeping the toes and balls of feet on the ground, lift the heels. These are done to strengthen the muscles of thighs. Sit in a chair. While your arms are resting on armrests, contract the right quadriceps and lift right leg. In this position, your thigh and knee must be two or three inches above the chair. Hold in this position for three seconds. Lower the leg slowly. Do 10-12 repetitions on each leg. This is one of the exercises for seniors to do at home that helps to stretch the back and shoulders. Bend right arm and raise it so that the elbow is at the level of chest and the fist is near the left shoulder. Put the left hand on right elbow and push right arm across the chest gently. Hold in this position for 20-30 seconds and repeat with opposite arm. This is done to strengthen the muscles of calves. Sit in a chair. Lift the right foot above the ground and rotate it gently five times to right and then to left. Stand with the feet placed at a distance of hips and the weight should be distributed evenly on both the feet. Your hands should be relaxed at the sides. You may also put a chair in front in case you require grabbing something to maintain balance. Shifting your body weight on the right side, lift the left foot a couple of inches above the ground. Hold in this position for 12 seconds, eventually making it 30 seconds. Return back to starting position. Repeat with opposite leg. Stand with the feet placed at a distance of hips and the hands on the hips. Lift the left foot above the ground, bend at knee and lift the heel halfway between buttocks and floor. Walking is among the best low-impact exercises to maintain endurance. It is not difficult to begin walking and it does not put strain on the joints. Hence, many elderly people can maintain a walking routine till quite late in their lives. Make sure to get right shoes and perform stretching exercises after walking for protecting the muscles and preventing injury. In case you are a beginner, walk short distances initially and increase gradually by few minutes every time till you may walk for 35-60 minutes. The stress on the joints and bones is relieved by swimming. Moreover, your entire body is conditioned as you move in water. It is associated with a reduced risk of injury in comparison to many other forms of exercises. It may even reduce the risk of bone loss in post-menopausal females. Strength training is combined with cardiovascular exercise in water aerobics for a full-body, low impact workout. The resistance provided by water strengthens the muscles while you move. Yoga combines endurance with strength training, stretches, balance and flexibility. Elderly must start with sessions for beginners or classes specifically designed for them. An enjoyment method to get daily exercise is by gardening. You can work the muscles by watering plants, digging the dirt, weeding and other activities of gardening. If you find that squatting and bending to dig or pull weeds is excessive activity for you, you can use a gardening stool so as to avoid injury to your knees and back. Tai chi is a type of meditative exercise in which one pose flows slowly to another. It helps in improving strength, flexibility and balance. It focuses on breathing that helps to reduce stress and improve concentration. The flowing, slow movements stretch and tone muscles and improve balance. It does not put strain on joints and helps in maintaining healthy weight. What Is the Best Exercise for Your Lower Abdomen? Is Your Heart Rate Normal After Exercise?